We want to thank everyone who has come to the drive and hope that more of you will come on out to the Dean E. Smith Center and give! We want your feedback on how the drive went this year. Please visit our feedback form and tell us how we did! This entry was posted in Summer Blood Drive on June 5, 2012 by Lynn Eades. As of noon, we have 484 productive units of blood collected. We need your help to reach our goal. Please consider coming down to the Dean E. Smith Center and giving the gift of life! We have collected 300 units toward our goal of 1,000! We need your help to reach it. Come on down to the Smith Center and give the gift of life. Need to check your appointment time? 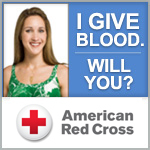 Visit redcrossblood.org and sign in to view your appointment. If you miss your appointment time, no worries! Come when you can. The need for blood is great and we need your help.